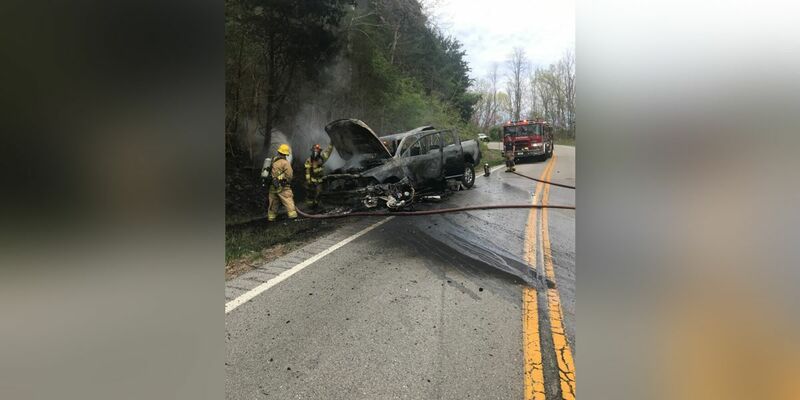 The Boone County Sheriff’s Office says it happened just south of “Four Corners” on Rabbit Hash Road at 4:02 p.m.
Carlos Rodriguez,27, of Florence was traveling north on a curved road when he lost control of his motorcycle and crossed into the southbound lane hitting a 2015 Dodge Ram pickup truck head-on, said police. Officers say it caused Rodriguez to be thrown out of his motorcycle and moments later, both vehicles went up in flames. The driver of the Dodge Ram, 25-year-old Brendon Dye, and the passenger, 50-year-old Robert Dye, were not injured. Rodriguez suffered a fracture to his right wrist and an upper leg injury, said officers. Police say Rodriguez was transported through Air Care to the University of Cincinnati Medical Center were he was treated with non-life threatening injuries.